Inside: Tips for organizing craft supples with the Konmari method of decluttering; tips for how to effectively declutter and purge your crafting supplies and then how to store them to suit your lifestyle and needs. Craft rooms and craft supplies can very easily get out of hand. We have every reason to hold onto every single scrap of whatever it is because we believe we’ll one day ‘maybe need it for an emergency craft session.’ Well, it doesn’t have to be that way. 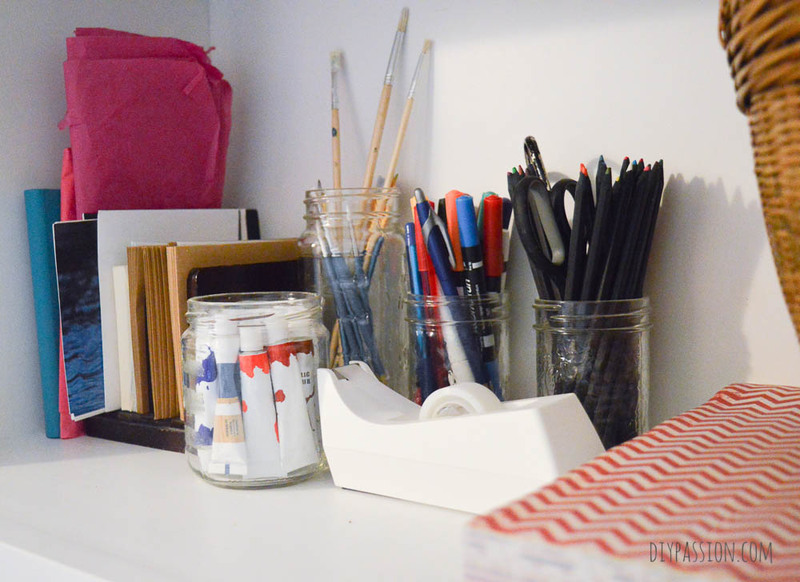 Today, I’m sharing my tips for organizing craft supplies with the Konmari Method, so your space stays clutter free and clear so you can craft your little heart out. Konmari is about keeping only things that give you true joy or that serve a higher human purpose – like food, shelter, water, security. 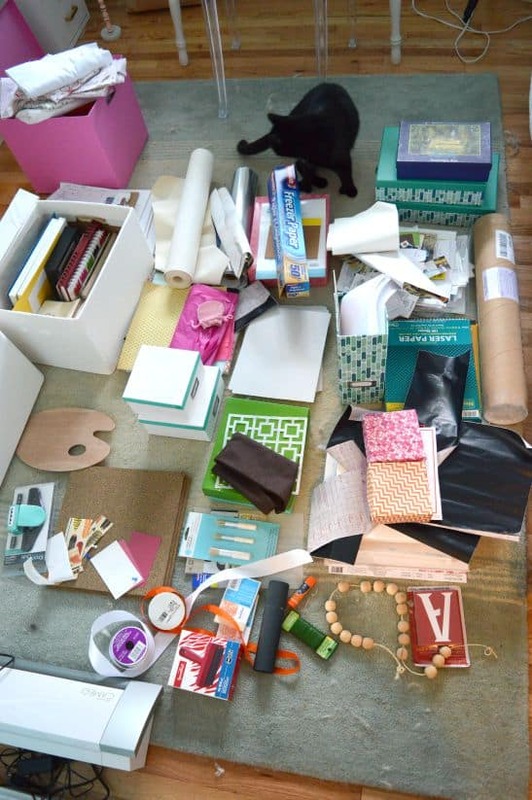 It’s hard to see how craft supplies fit into any of those categories. I believe we hold onto craft supplies because of the potential they hold. We feel good thinking about all the things we could make but never do. This is why these spaces tend to be neglected IMHO. We are ashamed of them because we think we like the untapped potential, but really they just represented thwarted joy. As you go through this process, really ask yourself if unused supplies truly give you joy or do they give you the illusion of joy? Go around the entire house and get your craft supplies from every nook and cranny and dump them all on the floor in one room. ALL OF IT. The whole idea behind this is to see all that you’ve been holding onto in one giant space. It can be a bit overwhelming, but it will get better. 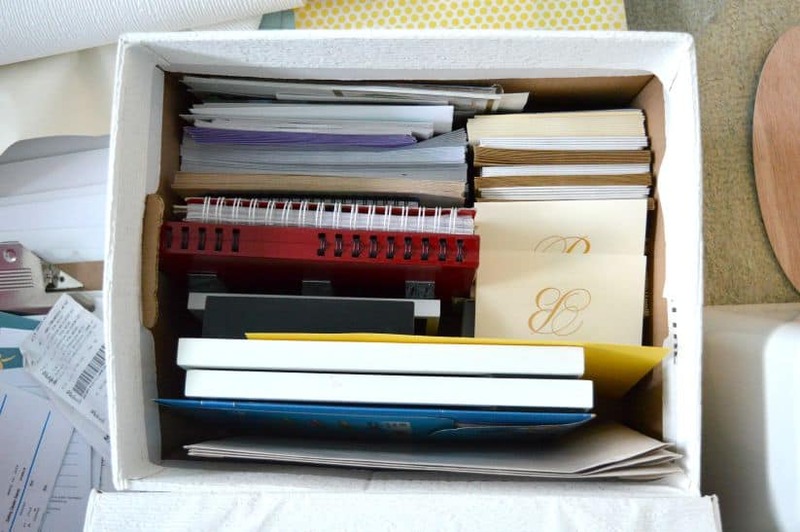 Marie Kondo lumps craft supply organizing in with paperwork and bills, but I choose to keep them separate. If you want to see how I manage my digital files, check out this post about how to make your own desktop file manager. Next you are going to sort your supplies into loose categories: (this will obviously depend on the kind of crafter you are). Toss anything broken. Donate anything unused or that you haven’t opened in longer than a year. Now you’re left with the rest. Go through it and really ask yourself if you intend to use it or if it’s just giving you an illusion of joy to hold onto it. It’s okay to let some things go – even if they are still in perfectly good condition. They aren’t reaching their full artistic potential sitting unused in your home! Go through each item. Be honest. Let some of them go. Hold only the craft supplies you know you will use time and time again. Here’s a tip, for the notebooks, I just ripped out pages that were used and kept the notebooks I knew I wanted for tracking blog projects, work projects etc. Anything that was unused or untouched, I donated. One of the first places you’ll want to look at are the walls! Using vertical space is always a bonus and it can be crafty and fun too. Why not try a DIY stencil pegboard to hold small craft items. Or if you have more fabric swatches and colourful bits of inspiration, try making your own DIY memo board to hold them. If space is at a premium, try converting an old piece of furniture into a craft supply station. I took an old kitchen cart on wheels and turned it into a craft cart! It was done in a day, and I love it. This is a great way to repurpose something else you have in your home as you go through the entire Konmari process. Breathing new life into old things is always encouraged and it is one of the best ways to create new spaces without spending any money! You could also try converting a bookshelf into paper and crafting storage. I used an old Ikea Billy bookcase to make my DIY gift wrap organizer. It hold other craft overflow as well, like ribbon, large scissors, Sharpie markers and tissue. If a lot of your crafting items are seasonal and Christmas, you might want to try a custom solution for that type of decor. Marie Kondo would suggest having a mix of open shelves, baskets and drawers. Keep the drawers for things that will always be unsightly, like manuals, and smaller items that aren’t aesthetic. Use baskets for textiles and then use open shelving for all the beautiful and useful items you’ve kept – like scissors, paint, brushes and the like. This is SO great! I found my craft supplies to be the worst collection of crap I didn’t need yet! SO freeing to clear all of that out and make a pretty space to create in again! Craft supplies don’t give me joy hahaha – I think that’s even helped me realize I’m not going to focus on a lot of crafting stuff on the blog! So in the end – it was a positive. Oh, so great to get this tackled, right? It looks gorgeous after- must feel so calming. The “practical” changes can be the most far-reaching I think. To have all that boring stuff dealt with!! It’s change the feeling in our entire house. It’s amazing. I’m tackling my own craft supplies this weekend, but I’m not really looking forward to it! However, seeing your’s after is going to help me push through! Thank you for sharing! Thanks for stopping in Kate! I’m loving the Konmari method. I’ve given away books I haven’t touched for 40 years; I had them just to have them. Craft supplies are IMO hard to cull, because they embody good intentions — you intend to hand-make all your Christmas cards, you intend to make a quilt for every new baby in the extended family, you intend to needlepoint pillows for every piece of furniture. All this stuff rarely-to-never happens!